2: Is my tetanus vaccination up to date? 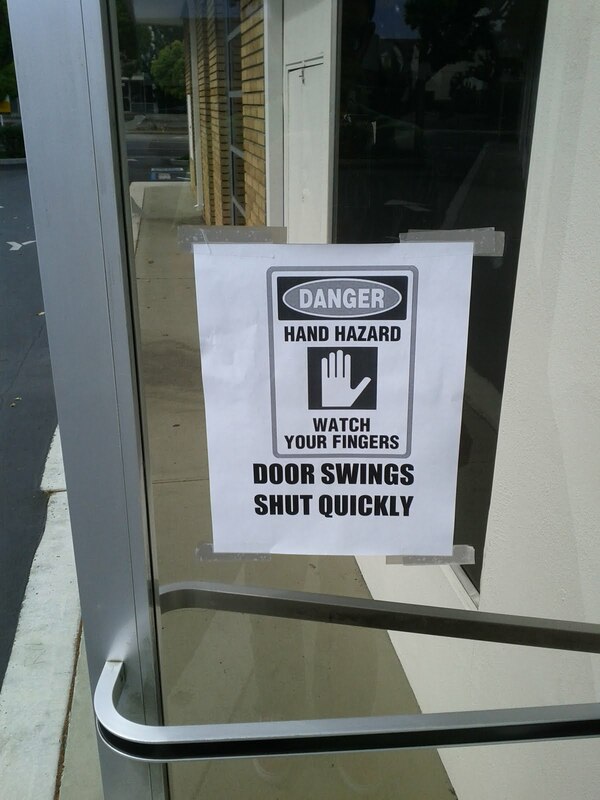 Any guesses as to why that sign might have been placed on the door? Well, let me tell you. For anybody stupid enough to try and walk through that door, and not wrap their arms around themselves in a ball and shuffle through, scared and whimpering,2 they need to be warned that if they don't keep their hand well clear of that door, they could end up next door, wiping industrial-grade gashes on their fingers3 with hand sanitizer, trying desperately to not personify complete and utter incompetence to their new boss and co-workers, and failing due to their need to lie down to avoid passing out over what to others appears to be the equivalent of a paper cut. 1. Like he did in the interview, ripping through my trousers. Lousy dog. We now stare at each other, knowing one of us will strike again, but each unsure of when and where it will occur. Watch your back, buddy. 2. Like I did at all other times when trying to walk through that door the rest of the day. 3. Incidentally, this also preceded one of my favorite gchat conversations ever, which included the phrase, "I just bled on the keyboard. awkward". It also had the undesirable effect of making it impossible for me to shake hands with people. Do you know how awkward it is to reject a hand shaking? Especially at church? Yeah. Awkward. 4. I don't know that there's any way I can recover from the damage done to my reputation. Seriously people, how do you show up to work after almost passing out because of some gashes on your fingers, after smashing them in a door that thousands of people have walked through without nary an incident? Seriously. If this were two hundred years ago, I'd be forced to move out of town in shame, never to return again. People in Germany reject handshakes all the time. They act shocked that you want to shake hands with them and surprised at themselves all at once before they wave their hands, palms forward, in front of their chests and tell you that they are sick and don't want to pass it on. Company dog, eh? Not a bad idea. And welcome back to the States, where you can call them pants again.